Cobb salad is perhaps my favorite salad. 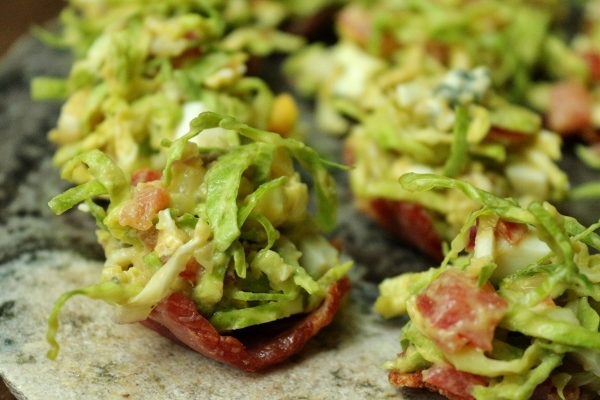 It was invented at the Hollywood Brown Derby, and is comprised of many delicious ingredients including avocado, bacon, blue cheese, tomatoes, hard-boiled eggs, and grilled chicken. I'm not much of a salad person in general, but I will never turn away a Cobb salad because to me it's so much more than just salad! It really is a meal. 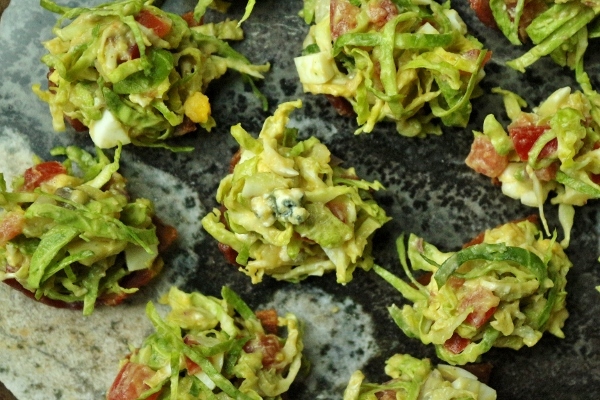 Cobb salad can easily be served as a satisfying entree, but why not serve it as a fun appetizer in the form of small Cobb salad bites served in bacon cups? As an American classic, serving it this way would be ideal for a Fourth of July gathering among friends and family. It is a bit fussy to assemble the individual bites, but I assure you the effort is worth it as the presentation is impressive for guests, and the bites themselves are absolutely delicious. This recipe replaces the lettuce with shredded Brussels sprouts, to maintain a crisper texture once the salad is dressed. I will, however, say that the bacon cups themselves are quite small (perfectly bite-size), and the quantity of Cobb salad is much greater than what I could comfortably divide up between my 24 bacon cups. 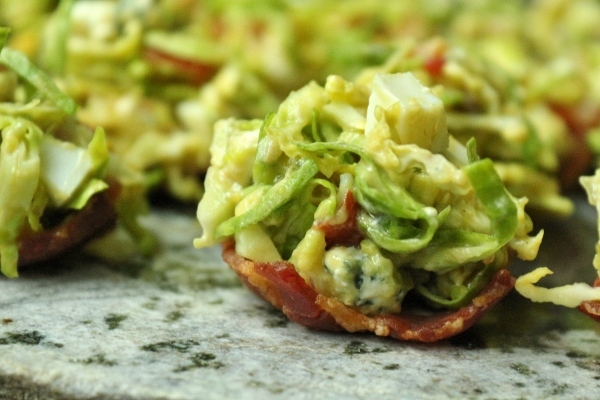 I would encourage those who make this recipe to either double the number of bacon cups, or perhaps halve the amount of salad. My excess salad was quite delicious on its own, and I happily snacked on it. To make bacon cups: Position racks in top third and center of oven and preheat oven to 375°. Turn 2 (12-cup) mini-muffin pans upside down and lightly spray with oil. 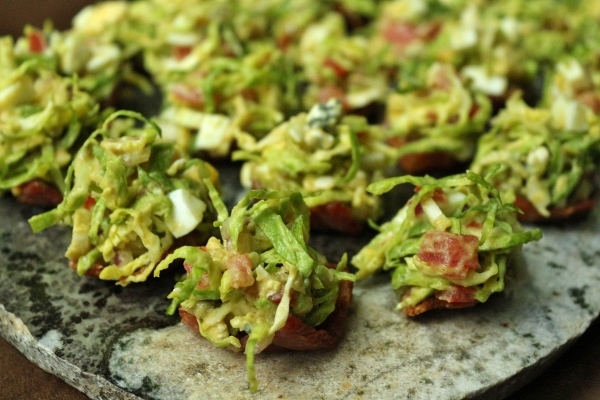 To serve, arrange bacon cups on a large platter. 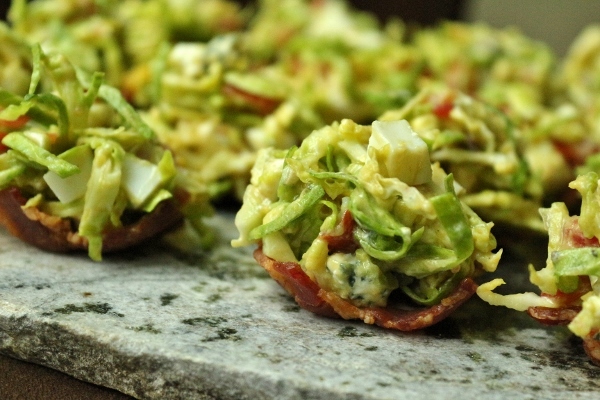 Divide salad, heaping in tall mounds, into bacon cups. Serve immediately.